May 15, 2015. Rock in Rio USA. Las Vegas, Nevada. Ed Sheeran appears to perform Tenerife Sea with Taylor Swift. Although it was not labelled an “official” 1989 World Tour concert, it actually shared the same playlist than the two 1989 World Tour concerts in Tokyo, Japan. May 30, 2015. Ford Field. Detroit, Michigan. Imagine Dragons’ Dan Reynolds comes out to perform Radioactive with T-Swizzle. Gigi Hadid and Martha Hunt walk the runway for Style. June 6, 2015. Heinz Field. Pittsburgh, Pennsylvania. Little Big Town and Taylor sing Pontoon. Taylor and Vance Joy welcome Kelsea Ballerini and Rachel Platten along with Little Big Town for an impromptu acoustic jam backstage. June 12, 2015. Lincoln Financial Field. Philadelphia, Pennsylvania. Echosmith sings Cool Kids with the Queen of Sparks. Mariska Hargitay and Cara Delevingne walk out during Style. June 13, 2015. Lincoln Financial Field. Philadelphia, Pennsylvania. 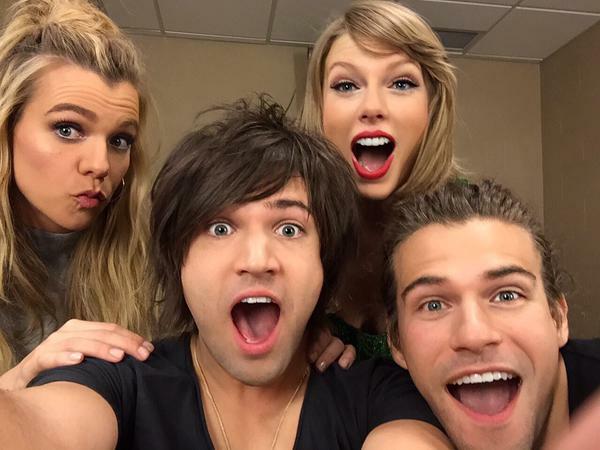 Rachel Platten comes out to sing Fight Song with Tay. Mariska Hargitay walks the runway during Style. June 27, 2015. British Summertime Hyde Park. London, UK. Karlie Kloss, Gigi Hadid, Martha Hunt, Cara Delevigne, Serena Williams and Kendall Jenner walk the catwalk turned runway for Style. Emma Watson is in the audience and meets the squad backstage. I write an editorial about it. June 30, 2015. 3Arena. Dublin, Ireland. The second of two nights in Dublin, Taylor breaks out Holy Ground as an acoustic song. It’s a throwback to the secret songs in previous concerts. July 7, 2015. Bell Center. Montreal, Quebec, Canada. No surprises, but it’s my concert. You can read my experience here. July 10, 2015. Metlife Stadium. East Rutherford, New Jersey. The Weeknd comes out to play Can’t Feel My Face. Heidi Klum and the US Soccer Team walk out during Style. Lily Aldridge, Gigi Hadid, Hailee Steinfeld and Lena Dunham appear in costume during Bad Blood. July 11, 2015. Metlife Stadium. East Rutherford, New Jersey. Nick Jonas comes out to play Jealous. Candice Swanepoel, Martha Hunt, Lily Aldridge, Karlie Kloss, Behati Prinsloo and Orange Is The New Black actress Uzo Aduba walk the runway during Style. July 13, 2015. Nationals Park. Washington, DC. 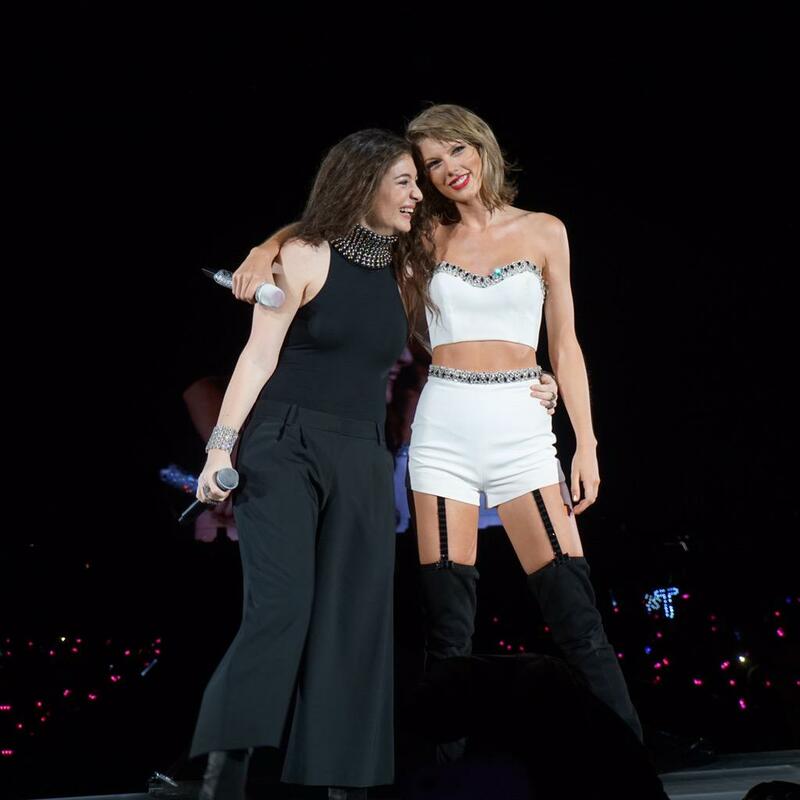 Lorde and Taylor perform Royals. July 14, 2015. Nationals Park. Washington, DC. Jason DeRulo comes out to sing Want To Want Me. July 18, 2015. Soldier Field. Chicago, Illinois. Andy Grammer performs Honey I’m Good with Taylor. Acoustic version of Fifteen. July 19, 2015. Soldier Field. Chicago, Illinois. Sam Hunt and Taylor perform Take Your Time. Acoustic version of Mean. July 24, 2015. Gillette Stadium. Foxborough, Massachusetts. Walk The Moon sings Shut Up And Dance. July 25, 2015. Gillette Stadium. Foxborough, Massachusetts. MKTO performs Classic. August 1, 2015. BC Place Stadium. Vancouver, British Columbia, Canada. Nico & Vinz sing Am I Wrong. Acoustic version of Sparks Fly. August 4 and 5, 2015. Edmonton, Alberta, Canada. Acoustic version of Fearless. August 8, 2015. CenturyLink Field. Seattle, Washington. Fetty Wap sings Trap Queen with T-Swizzle. Ciara and Russell Wilson walk out with Style. Acoustic version of Mean. August 14, 2015. Levi’s Stadium. Santa Clara, California. Taylor Swift joins Fifth Harmony to sing Worth It. Acoustic version of Should’ve Said No. August 14, 2015. Levi’s Stadium. Santa Clara, California. Little Mix performs Black Magic with T-Swizzle. Acoustic version of Never Grow Up. August 18, 2015. Gila River Arena. Glendale, Arizona. Acoustic performance of Ronan. August 21, 2015. Staples Center. Los Angeles, California. Ryan Tedder from One Republic performs Counting Stars. Taylor performs an acoustic version of All Too Well. Kobe Bryant appears to present Taylor with her very own banner for selling 16 sold-out shows. August 22, 2015. Staples Center. Los Angeles, California. Mary J. Blige sang two songs with Taylor: Doubt and Family Affair and Uzo Aduba showing her musical chops in a duo with the Enchantress singing the classic White Horse acoustically. Sean O’Pry, Chris Rock and Matt LeBlanc walk out during Style. August 24, 2015. Staples Center. Los Angeles, California. Alanis Morissette came out to sing You Oughta Know. Natalie Maines from the Dixie Chicks performed Goodbye Earl with Taylor. Ellen DeGeneres walks the runway during Style. The acoustic song was Fifteen. August 25, 2015. Staples Center. Los Angeles, California. The Enchantress brought out Beck and St. Vincent for a cover of Dreams. John Legend took command of the piano to perform All Of Me. August 26, 2015. Staples Center. Los Angeles, California. Taylor sings Mirrors with Justin Timberlake and performs Good For You with Selena Gomez. Lisa Kudrow comes out as Phoebe Buffay to sing Smelly Cat. August 29, 2015. PETCO Park. San Diego, California. 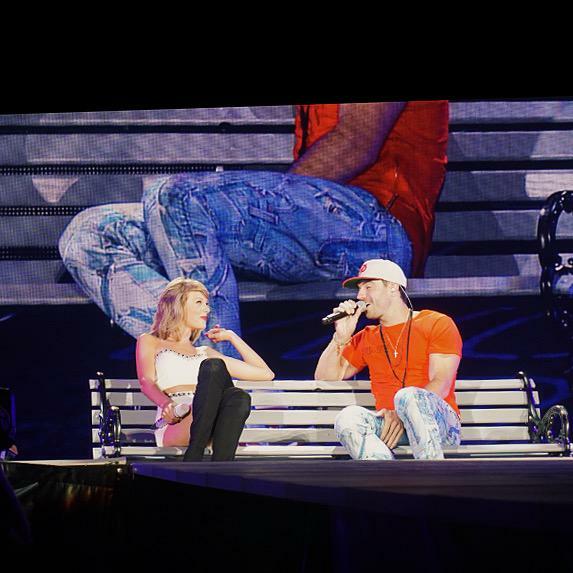 Omi comes out to sing his hit Cheerleader with T-Swizzle. Avril Lavigne also performs her classic hit Complicated with the Blonde With The Sparkly Guitar. Taylor sings an acoustic version of Fearless. September 4, 2015. EnergySolutions Arena. Salt Lake City, Utah. The acoustic song was You Belong With Me. September 5, 2015. Pepsi Center. Denver, Colorado. The acoustic song was Fifteen. September 6, 2015. Pepsi Center. Denver, Colorado. The acoustic song was You Belong With Me. September 9, 2015. Minute Maid Park. Houston, Texas. Taylor brings out Wiz Khalifa to sing See You Again. September 11, 2015. Minute Maid Park. Houston, Texas. Taylor sings an acoustic version of Fifteen. September 12, 2015. Minute Maid Park. Houston, Texas. Taylor sings an acoustic version of Mean. September 13, 2015. Minute Maid Park. Houston, Texas. Taylor sings an acoustic version of You Belong With Me. September 16, 2015. Bankers Life Fieldhouse. Indianapolis, Indiana. Taylor brings out The Band Perry to sing If I Die Young. September 17, 2015. Nationwide Arena. Columbus, Ohio. The acoustic song is Red. September 18, 2015. Nationwide Arena. Columbus, Ohio. The acoustic song is You Belong With Me. Taylor brings out Sydney Sierota from Echosmith to sing Cool Kids. September 21, 2015. Sprint Center. Kansas City, Missouri. The acoustic song is You Belong With Me. Taylor shares the stage with Dierks Bentley to sing Every Mile A Memory. September 22, 2015. Sprint Center. Kansas City, Missouri. The acoustic song is Fifteen. September 25, 2015. Bridgestone Arena. Nashville, Tennessee. Taylor Swift brought out Kelsea Ballerini to sing Love Me Like You Mean It. Steven Tyler also joined Taylor to sing I Don’t Want To Miss A Thing. Alison Krauss also came out to sing When You Say Nothing At All with Taylor at the piano. September 26, 2015. Bridgestone Arena. Nashville, Tennessee. The acoustic song was Fifteen. Leona Lewis sang Bleeding Love with Taylor Swift. T-Swizzle also brought out Mick Jagger to sing Satisfaction. September 28, 2015. Scottrade Center. St. Louis, Missouri. The acoustic song was You Belong With Me. September 29, 2015. Scottrade Center. St. Louis, Missouri. The acoustic song was Fifteen. Abigail Andersen was in the audience. Taylor brings out Nelly to sing The Fix. HAIM joins Taylor and Nelly to sing Hot In Herre. This was HAIM’s last time as the opening act for the 1989 World Tour. October 2, 2015. Rogers Centre. Toronto, Ontario, Canada. The acoustic song was You Belong With Me. The secret guest was Keith Urban. He performed John Cougar, John Deer, John 3:16 and Somebody Like You. October 3, 2015. Rogers Centre. Toronto, Ontario, Canada. The acoustic song was Fifteen. Taylor brings out Charli XCX to perform Boom Clap. October 8, 2015. Wells Fargo Arena. Des Moines, Iowa. The acoustic song was You Belong With Me. October 9, 2015. CenturyLink Center. Omaha, Nebraska. The acoustic song was Fifteen. October 10, 2015. CenturyLink Center. Omaha, Nebraska. The acoustic song was Fearless. October 12, 2015. Fargodome. Fargo, North Dakota. The acoustic song was Fifteen. October 17, 2015. AT&T Stadium. Dallas, Texas. T-Swizzle brings out Ellie Goulding to sing Love Me Like You Do. The acoustic song was Fifteen. October 20, 2015. Rupp Arena. Lexington, Kentucky. The acoustic song was Fifteen. October 21, 2015. Coliseum Complex. Greensboro, North Carolina. Taylor and Miranda Lambert perform Little Red Wagon. The acoustic song is Fifteen. October 24, 2015. Georgia Dome. Atlanta, Georgia. The acoustic song is Fifteen. Taylor brings out Tove Lo to sing Talking Body. October 27, 2015. American Airlines Arena. Miami, Florida. T-Swizzle brings out Pitbull to sing Give Me Everything and Ricky Martin to sing Livin’ La Vida Loca. Dwyane Wade presents Tay with her own Miami Heat personalized jersey. October 31, 2015. Raymond James Arena. Tampa, Florida. Taylor brings out Alessia Cara to sing Here and Idina Menzel to sing Let It Go. She sang Fifteen on the acoustic stage. November 7, 2015. Singapore Indoor Stadium. Singapore, Singapore. This Love re-appears on the set list, but just for one night. You Belong With Me is sang acoustically. November 8, 2015. Singapore Indoor Stadium. Singapore, Singapore. You Are In Love is sang on the B Stage. November 10, 2015. Mercedes-Benz Arena. Shanghai, China. This Love appears on the set list again. You Are In Love is sang acoustically. November 11, 2015. Mercedes-Benz Arena. Shanghai, China. Taylor sings You Belong With Me on the B Stage. November 28, 2015. ANZ Stadium. Sydney, Australia. You Are In Love is the surprise acoustic song on the B Stage. December 5, 2015. Suncorp Stadium. Brisbane, Australia. Mine is sang acoustically on the B Stage to honor Rachel, a fan who passed away. December 7, 2015. Entertainment Center. Adelaide, Australia. You Are In Love is the surprise song on the acoustic stage. December 8, 2015. Entertainment Center. Adelaide, Australia. You Belong With Me is sang acoustically on the B Stage. Special thanks to @TSwiftOnTour for being a reliable source of concert information.